The New Zoll AED Plus with 7 year warranty is like no other AED unit. It provides complete instruction for AED and CPR application. The Zoll AED Plus uses loud, clear voice prompts to instruct the user when, where, and how to apply the AED pads. Then it informs the user when to shock or not shock the victim. What separates the Zoll AED Plus from all other AED units is that it provides complete CPR coaching through the entire revival process. It instructs the user where to compress the chest of the victim, when to compress and how hard to compress. Simply follow the voice prompts to ensure high quality lifesaving AED and CPR application. Medical studies support that high quality AED application coupled with high quality CPR application provides the victim with the greatest chance of survival. That's the Zoll advantage. 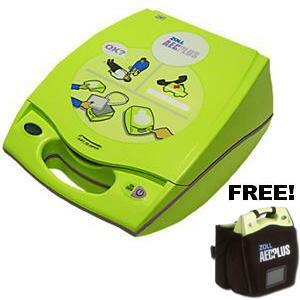 The ZOLL AED Plus makes AED and CPR application fool-proof, and perfect for the novice rescuer. The Zoll AED Plus also has an optional ECG upgrade, making it the perfect choice for medical professionals. The Zoll AED Plus has optional pediatric electrode pads, making it the perfect choice for schools, daycare centers, and places frequented by children. Finally, the ZOLL AED Plus is the only AED that uses inexpensive Duracell consumer batteries. There's no need to buy expensive proprietary battery packs for this machine. Over the life of the AED, you can be sure to save hundreds of dollars, and hours of labor by being able to test and replace your own batteries without the help of a professional. That's the Zoll advantage.